CountOps is an FAA automated system that utilizes data from National Offload Program (NOP), STARS, and Common ARTS to provide hourly counts of air traffic activity at TRACONs, towers, and airports. It includes counts for more than 2,000 towers and airports. Daily facility totals in CountOps align to official OPSNET counts of operations for OPSNET facilities. While OPSNET only includes daily facility counts, CountOps also contains information on arrivals and departures by hour and additional detail on individual operations. CountOps standards for counting operations are based on criteria as outlined in FAA Order 7210.3 Chapter 12, and the “Classification Count” as outlined in FAA Order 7210.57 and associated Facility Classification Standard. 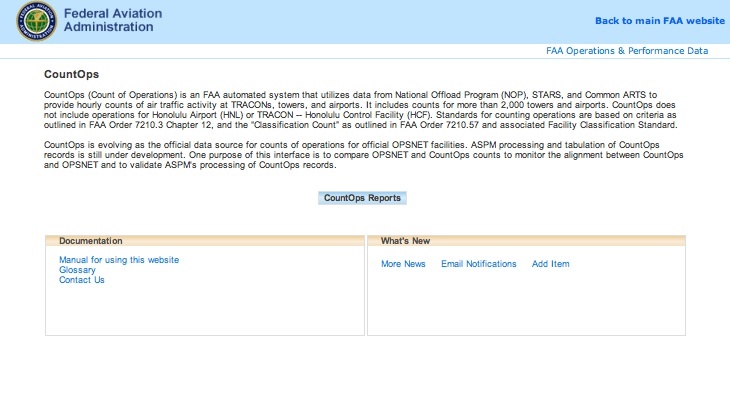 CountOps data can be viewed on the FAA Operations & Performance Data Web site. CountOps utilizes data from National Offload Program (NOP), STARS, and Common ARTS. The data are updated daily. The operations data for most facilities are available the following day, but occasionally files are missing due to timing issues (for example, data for facilities in the Western U.S. are not received in time for the daily processing) or other occasional transmission interruptions. CountOps data are available for a few facilities from January 2010, but most are not available until March 2010. CountOps does not include operations for Honolulu Airport (HNL) or TRACON (Honolulu Control Facility – HCF). View the CountOps Manual for a detailed explanation of how to create reports based on CountOps. For more information about these topics, please see the Definitions of Variables for the CountOps system. This page was last modified on 3 April 2018, at 16:45.